The above info came from Shizune, and was edited by yours truly (contact me). After being secluded for his entire life, a boy called Aladdin travels the world until he meets Alibaba Saluja, a young man aiming to one day explore the nearby dungeon Amon and claim its treasures. Aladdin and Alibaba eventually become friends, and conquer Amon together, despite facing the opposition of the ruthless Jamil and his slave warriors, with only Alibaba, Aladdin and Morgiana, the only survivor of Jamil's party, escaping with their lives. For some reason, Aladdin ends up teleported to a distant land, far away from the others, where he learns that he is a Magi. Having no news of his friend, Alibaba uses the treasure he obtained in Amon to free all slaves in the city, including Morgiana and returns to Balbadd, his homeland. After having their own adventures in separate locations, Aladdin and Morgiana end up reuniting with Alibaba in Balbadd where they learn that he has joined the Fog Troupe, a cadre of thieves opposing the tyrannical rule of King Abhmad, Alibaba's half brother. Helped by Aladdin, Morgiana and Sinbad, a famous king of the island country of Sindria, Alibaba manages to have the monarchy dissolved and establishes a republic in Balbadd. 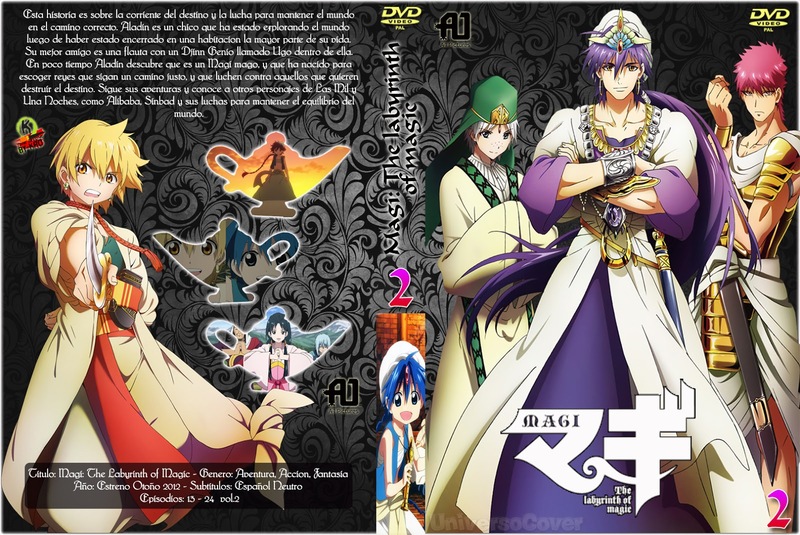 However, Balbadd ends up annexed to the Kou Empire, a powerful Eastern nation that plans to conquer the entire world under the pretense to put an end to all conflict between the nations.Following the events in Balbadd, Aladdin, Alibaba and Morgiana are brought to Sindria, where they train under members of Sinbad's household to increase their abilities and help him with his mission to stop the mysterious organization Al Thamen that works in the shadows to spread chaos throughout the world as part of an unknown agenda. The trio ends up befriending Hakuryuu Ren, a prince of the Kou Empire visiting Sindria and whom they help to conquer the dungeon Zagan. After confronting some members of Al Thamen, Aladdin and his friends go separate ways for personal reasons, promising to rejoin together in the future. Aladdin enrolls in the Magnostadt Academy to study magic, Alibaba leaves to improve his swordsmanship and learn magoi manipulation in order to complete his djinn equip with the Yambala Gladiators in the Reim Empire, Hakuryuu returns to the Kou Empire, and Morgiana departs to the Dark Continent to fulfill her dream of visiting her homeland. One year later, Aladdin and Alibaba are reunited during Reim's campaign to conquer Magnostadt and after they help defend the city, the Kou Empire launches a surprise attack. To defeat the invaders for good, the city's leader Matal Mogamett summons an army of Dark Djinns with a huge mass of Black Rukh stored in its deepest level. However, Aladdin reveals that by doing this, Mogamett unwillingly helped Al-Thamen to get closer to their main objective, which is to summon their god, Il Illa, whose advent will cause the world's destruction. To prevent it from happening, Aladdin and his friends join forces with the Kou Empire, the Reim Empire and Sinbad's confederation, the Alliance of Seven Seas to stop the summoning.A few months later, representatives from Kou, Reim and Sindria gather for a summit organized by Sinbad. In the occasion, Aladdin reveals all the truth regarding Al-Thamen, their role in the destruction of Alma-Torran, which is the original world of mankind, among several other species with intelligence, each having their own civilization, and their exodus to the current world. However, the summit is interrupted by news that Hakuryuu seized power in the Kou Empire, overthrowing his mother and empress Gyokuen Ren, who is also revealed to be Arba, the founder and leader of Al-Thamen, leading to a civil war between supporters of Hakuryuu's and his older brother Kouen's, which leads to Kouen's faction's defeat after Sinbad and his allies join Hakuryuu's side. The above description came from Shizune, and was edited by yours truly (contact me).